When one decides to participate in the programs of IPP, they find it means engaging in a process of healing and integration. At Insight Prison Project we facilitate the process of healing and integration through the development of insight and learning how to effectively process difficult emotions both of which often lead to an awakening to one’s true self. The Insight Prison Project believes that at the root of most offending behaviors are entrenched negative behavioral patterns learned from early childhood and adolescence. 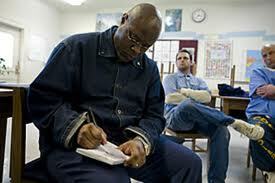 Our curriculum is designed for incarcerated populations to develop insight, practice new skills while in classes, and then integrate these new skills into all aspects of their lives outside of group meetings and after leaving prison. Insight is the power of having a clear or deep perception of a situation: understanding clearly. IPP’s method for creating insight begins with awareness or self-awareness, a practice that when engaged in literally increases one’s consciousness. IPP uses three fundamental approaches for developing self-awareness. Learning these skills can produce “a change of heart” from reacting impulsively to making conscious choices, and can represent the difference between committing a crime or not. The following describes these three practices. Mindful Awareness is being conscious and present in the moment, having a clear perception of what is happening without the mind judging the experience. Mindful Awareness necessitates feeling into the body to: observe what is actually occurring in the moment, discover valuable clues to one’s mental, emotional and physical state, and to create an opportunity to pause before resorting to habitual reactive ways of thinking, feeling and acting. Emotional intelligence can be described as the ability or skill to identify, evaluate and manage our emotions. Emotional intelligence involves effectively understanding oneself and others, relating well to people, and adapting to and coping with situations and individuals. Critical thinking involves self-reflection to rationally evaluate our interpretation of situations and circumstances. Critical thinkers strive to improve their reasoning abilities and recognize that at times they will make mistakes due to human irrationality, prejudices, biases, uncritically accepted social rules and taboos, and self-interest. Critical thinkers learn that often what causes their anger, upset or depression, is not so much about the world around them but how they view and interpret circumstances. A primary aim of the Insight Prison Project’s programs is to facilitate a process of awakening to who you truly are. By developing insight through an increased awareness of the connection between the mental, emotional and physical aspects of one’s being, utilizing emotional intelligence and critical thinking, and by learning tools to effectively process difficult emotions each of us has the opportunity to rediscover our most authentic self. You are absolutely critical to our work. The California Department of Corrections and Rehabilitation does not provide us with any funding to run our programs in their prisons. We started in 1997 from the efforts of community members who saw a need to shine a light in one of the dark places in our culture, and ever since it has been our staff, facilitators, volunteers and supports who continue to shine this light and make it possible for us to continue. 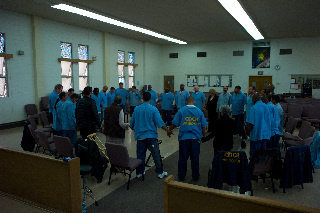 Only with your help can we succeed at transforming the lives of those impacted by incarceration. Please join us in working together to make a better future for the men, women, and communities we serve. Learn more. "IPP has given me the ability to think; to pause and come up with a decision which could be a life-changing one. I has given me the ability to witness my feelings and emotions, and to understand I can experience them and not react, but respond" - D.B.